We always think about marinated artichoke hearts but have you ever tried your hand at roasting them? Not only does this bring out their natural sweetness, but when oven roasted, the artichoke's texture completely transforms into a more crunchy and caramelized version of its soggy self. In this sandwich I combine the crispy and golden roasted artichoke hearts with creamy and rich Mecox Cheddar between two slices of sourdough and a hefty drizzle of hot pepper infused olive oil. 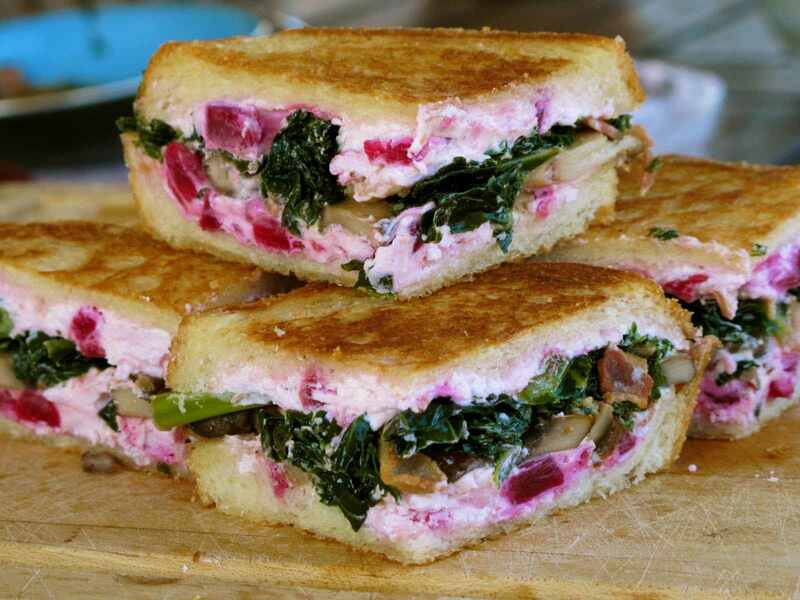 This sandwich may sound simple but the flavors are totally complex and exciting. Buttery roasted corn, spicy jalapenos, and rich manchego cheese come together in this zesty grilled cheese. This green bean casserole takes all the goodness from the classic dish and transforms it into a holdable grilled cheese sandwich! Camembert not only adds a richness to the sandwich but it also mocks the gravy aspect of the dish. And by adding the french onion dip seasoning to the top, you get even more of that awesome retroness. So it's Thanksgiving Day and you're stressed. But ya know what? The big meal is the least important part. We all know it's about the leftovers so go ahead and put on your elastic lined pants, pour yourself a stiff drink, and get ready for some deliciousness because this leftover sandwich just got real. You know all that soggy leftover stuffing? Yeah? Well, put that slop into a waffle press and get ready to make the best thing that’s ever been created. Add some muenster cheese, a little bit of crappy cranberry jelly, and a big ole heaping pile of mashed potatoes and grill it. I have to admit that when I dreamt up a poundcake grilled cheese, I thought that I was a pure genius. The buttery, sweet bread crisps up so beautifully and when paired with sweet and earthy fig jam, and creamy brie, well the combo gets even more delicious. I've served this sandwich for breakfast with a side of bacon, for dessert with powdered sugar on top, and pretty much any time that I've had poundcake around. To read the original blog post or to view step-by-step photographs, please click[HERE] to visit GrilledCheeseSocial.com. Beecher's Cheese, out of Seattle WA, makes this super special cow's milk blend called No Woman. It's sort of a sweet and spicy jerk flavored cheese that not only tastes amazing but also melts really beautifully. With some spicy pepper jack cheese from Tillamook Cheese, a heaping spoonful of sweet and creamy apple butter, and a buttery and perfectly flaky croissant, this grilled cheese encompasses one of my favorite flavor combo’s SWEET & SPICY (and buttery) and it’s an excellent little treat that pairs nicely with an acidic Sauvignon Blanc. Chocolate and cheese are a match made in heaven. And when you use Carr Valley's Vanilla Cardona, well things get even more dreamy. Want to know more? It makes sense that acaprese sandwich, typically made with tomato, mozzarella, basil, olive oil and balsamic vinegar, would translate well into a grilled cheese. Sure, the classic version is typically made on an un-toasted baguette but who doesn't like crispy grilled bread? Especially when it's rubbed down with fresh garlic. Arugula pesto is the star of this savory breakfast grilled cheese and not only is it a super flavorful and bright spread, but it's also super easy to make! When paired with creamy scrambled eggs, some tangy goat cheese and two slices of crispy buttered whole wheat bread - this sandwich will instantly become a household favorite. And best of all, it only takes a few minutes to make and when wrapped tightly in tinfoil, it becomes the perfect sandwich for mornings on the go! Sweet apricots, tart blueberries, flower-y honey and fragrant basil combine to create a summertime fruit bruschetta that goes excellent inside of grilled cheese. The main star of this sandwich is Goat's brie, but unlike the typical cow's milk variety that one normally finds at the market, this blend is much tangier and has a really nice lemon-y finish. And when these two components meld together between two crusty buttery slices of french bread, the result is a sweet, savory, and bold grilled cheese.